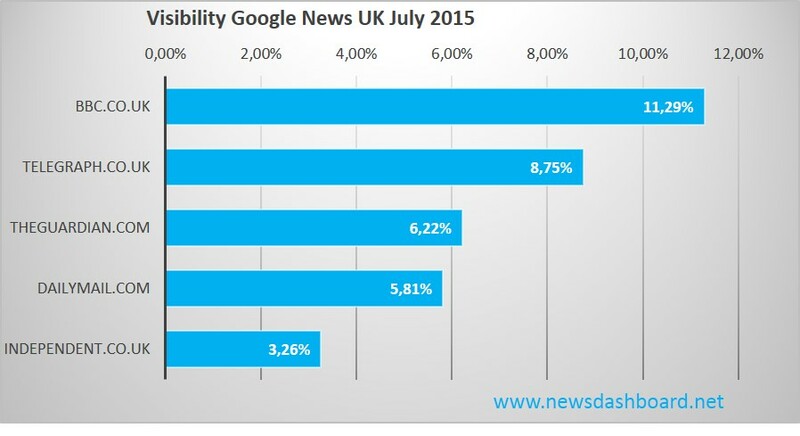 As it is the beginning of August it is time for our monthly analysis of the Google News Data. 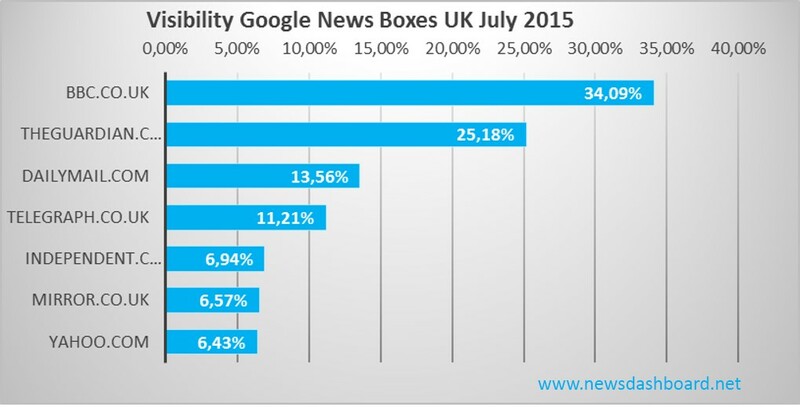 We look both on the Data for the Google News Boxes for the UK in July as well on the visibility data for Google News itself. The BBC and The Guardian are again top of the list as the visibility in the Google News Boxes is concerned. Their articles can be found in nearly 60% of Google News Boxes in the organic Google search. The midfield of successful players is build by dailymail.co.uk and telegraph.co.uk which reach both over 11% visibility per month in the Google News Boxes. The race for 5th place, which is normally the last one we publish was very close in July. Two days before the end of the month the online news offering of the Independent and the Mirror had exactly the same visibility. The last two days decided the race and independent.co.uk reached the fifth place followed closely by mirror.co.uk and yahoo.com. As the visibilty in Google News for July 2015 is concerned the results differ from the picture for the Google News Boxes. The BBC is again first, but with a much lower visibility than in the News Boxes. The Top5 Players are again the same, but the places behind the BBC differ from the situation in the News Boxes. The relative position of telegraph.co.uk is better for Google News whereas The Guardian and The Daily Mail are one rank behind their results in the former analysis.